I’ve long admired Jeff Halper‘s work with the Israeli Committee Against House Demolitions (though to me, haunted by the passages from The poetics of place that Edward Said invokes in Orientalism, ‘home demolition’s would carry even more resonance: it’s so much more than buildings that the Israelis so brutally turn to rubble). Jeff’s classic, even canonical essay on ‘the matrix of control‘ (see also here) was a constant reference point for my chapters on occupied Palestine in The Colonial Present, and on my first visit to the West Bank I was part of a group that Jeff generously spent a day showing the materialities of military occupation and illegal colonisation: you think you know what you’re going to see, but all the reading in the world can’t prepare you for what Israel has done – and continues to do – to the people of Palestine. I’ve noted before the ways in which Israel has used its continuing occupation of Palestine as a laboratory to test new technologies of military violence – and as a series of test cases designed to push the envelope of what is permissible under international humanitarian law and even international human rights law – but here Jeff radicalises the argument to develop a deeply disturbing vision of what he calls ‘securocratic wars in global battlespace’. It’s vitally necessary to remember that later modern war is not the exclusive artefact of the United States and its military-academic-industrial-media (MAIM) complex, and that what happens in Israel/Palestine has desperately important implications for all of us. Many commentators have claimed – I think wrongly – that one of the new characteristics of war in the twenty-first century is that it has become ‘war amongst the people’: as though No Man’s Land on the Western Front was somehow roped off from the gas attacks and shells that assaulted farms, villages and towns behind the front lines, for example, and air raids were limited to exclusively military-industrial targets. Even if we confine ourselves to the trajectory of ostensibly modern warfare and track forward through the Second World War, Korea, Malaya, Vietnam, Laos and Cambodia…. the story is the same: modern war has long been fought amongst the people (though increasingly amongst ‘their’ people). The deconstruction of the battlefield, as Frédéric Mégret calls it, is clearly visible in Palestine and is inseparable from its globalization. 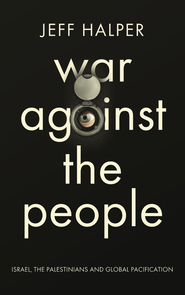 It’s hardly surprising, then, that ‘war amongst the people’ should so easily turn into what Jeff describes as ‘war against the people’. Introduction : How Does Israel Get Away With It? This entry was posted in books, Israel/Palestine, late modern war, military occupation, new wars, security, surveillance, technology and tagged deconstruction of the battlefield, Frédéric Mégret, hybrid warfare, Jeff Halper, matrix of control, securocratic wars by Derek Gregory. Bookmark the permalink.